It took a small army of investigators, mathematicians, lab rats, geneticists, and programmers to discover the tactics used by the Mutant Clones to withstand every effort to destroy them. In 2005, five labs independently discovered the presence of the JAK2 mutation common to most MPN patients. Over the next seven years , we in the MPN community have taken heavy casualties, dead and wounded, at the hands of a crafty, relentless enemy that despite intensive bombardment with medical technology has shown itself surprisingly resilient and capable of counter-attack. Now, a breakthrough. A group of scientists across multiple institutions — funded in part by the NCI, the LLS and MPN Research Foundation — has cracked one part of the enemy code that should allow us to mount a new offensive with improved tactics and the promise of more effective weapons. This is a commentary on their report as it appeared in Nature, last week. (1) Resistance to Jakafi therapy is reversible. Withdrawal from JAK2 inhibitor therapy results in renewed sensitivity to the drug’s ability to interrupt expression of the JAK2 clone. (2) Even those cells that persist in generating MPN blood products despite JAK2 inhibition still depend on the JAK2 protein expression. Thus treatments that inhibit or degrade JAK2 like (Heat Shock Protein 90 or HDAC –histone deacetylase inhibitors) are likely to benefit MPN patients. The Letter published in the journal Nature last week, provides some answers to vexing myelofibrosis question and holds out hope that exhausted benefits from Jakafi therapy might be revived after a short interruption. 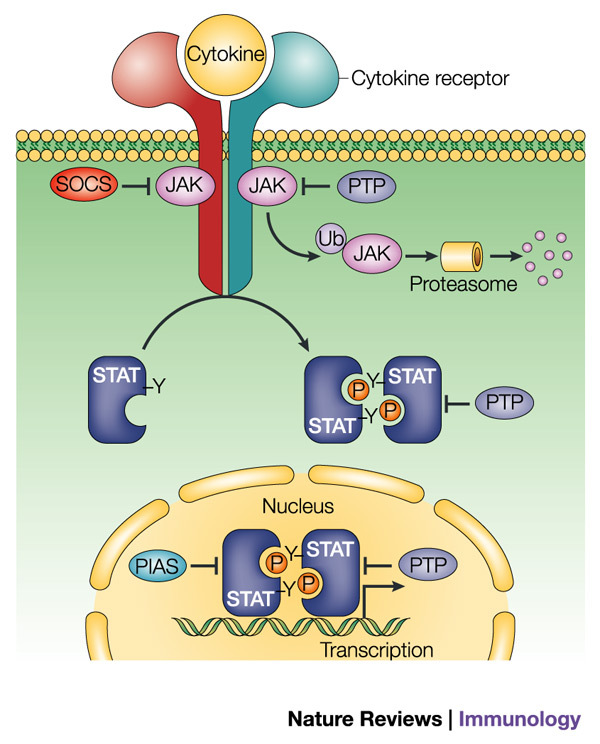 Filled with dense scientific terminology and technical references, the Letter Heterodimeric JAK-STAT activation as a mechanism of persistence ot JAK2 inhibitor therapy has all the earmarks of a scientific breakthrough. The findings it reports will likely be translated into drug development and new therapy protocols. Ross Levine, one of the investigators sharing in the discovery of the JAK2 mutation in 2005, is lead author. 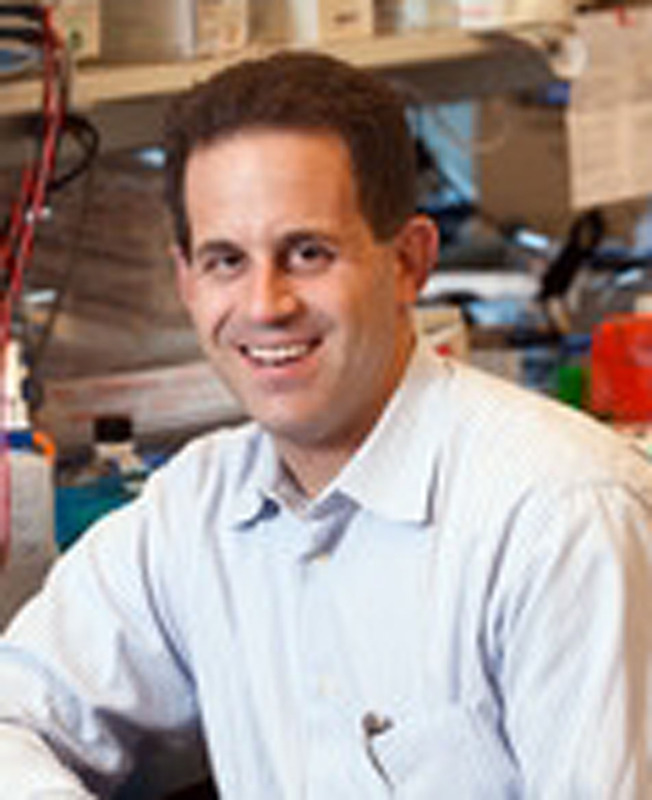 He and his associates at Memorial Sloan Kettering, along with investigators from MD Anderson, Howard Hughes, the Broad Institute and Harvard Medical School explored a well-observed phenomenon: Some cells requiring JAK2 signalling to produce one or more blood lines continue to churn out MPN cells despite the presence of JAK2 inhibitors. That phenomenon helped spark the research that led to these discoveries. In 2005 a single mutation — JAK-V617F — was found to be common in many MPNs, a crossed signal arising during reproduction that produced a mutation in an enzyme critical in signaling blood production. Because of their role in hematopoiesis, the tyrosine kinases – TYK2, JAK1, JAK2, and JAK3 – are of special interest to those tracking the causes of blood cancers. The focus has been on JAK2 the mutated enzyme showing up in almost all cases of PV and most MPNs. While the signaling pathways and biochemistry are complex, the process itself is fundamentally simple. Phosphorylation, the addition of a phosphate to a protein, activates a protein, turns it on. The JAK2 mutation created an enzyme that phosphorylates itself, that is always active whether or not the body is signaling for production of a specific blood element. The result can be proliferation of platelets or erythrocytes (red blood cells) . The excessive blood production produces all the symptoms common to MPNs along with fibrosis in the overworked marrow. For some reason, despite the effective inhibition of JAK kinases and the reduction of patient symptoms, the MPN disease burden continued unabated. Based on these observations, investigators looked at these Jakafi-resistant cells in light of the central role of the JAK-STAT pathway. JAK-STAT is the main transducing pathway downstream of growth factors EPO and Thrombopoietietin. The most common disruption in the JAK-STAT pathway is the JAK2 v617F mutation, the signature MPN mutant clone. Hematopoiesis requires cytokine signalling mediated by tyrosine kinases, the JAKs, and a downstream protein within the cell, the STAT (Signal Transducters and Activators of Transcription). Once activated the STAT dimer enters the cell nucelus and docks at the appropriate DNA point to pass on the signal and get the blueprint of a target gene. In humans, there are four JAK enzymes and five STAT proteins. It takes a pair of each – a dimer – to get the process going. Levine et.al. reported it is not only the JAK2 enzyme that can provide the necessary kickstart, or a team of two JAK2 enzymes — a homodimer. Other JAK enzymes – like TYK1 and JAK1 – can join with JAK2 to form a heterodimer — effective in activating the STAT proteins. Calling on other JAK kinase clan members to stand in for the inhibited JAK2 enzyme has proven an effective strategy for the mutant clone. The resulting heterodimer complex is persistent enough that JAK cells become resistant to the effects of JAK inhibitors. The good news: While activating JAK-STAT signaling with the help of other JAKs can maintain or increase the disease burden, the process is reversible. Remove the JAK2 inhibition and the cell becomes resensitized, the patient once again amenable to inhibition therapy. These heterodimeric cells that persist in producing MPN cells in the presence of inhibitors,are nevertheless “still dependent on JAK2 protein expression,” suggesting continued therapeutic use of such inhibitors in face of persistence. This research provides important clues as to why, once Jakafi demonstrates its effectiveness at some point, it simply becomes ineffective in controlling myelofibrosis symptoms. To put it another way, MPN cells survive despite chronic inhibition of JAK kinases enabling MF to overwhelm the therapy. This is not, say the authors, a case of acquired drug resistance due to mutation or some other factors. The inablility of JAK inhibitors to decrease the burden of mutated cells is “due to persistent growth and signalling” despite JAK2 kinase inhibition. That signaling is possible because other JAK kinases are recruited to complete the formation of the dimer necessary to produce the mutant clone. These heterodimers both expand the clone’s staying power…and present promising new targets for drug developers. Then there’s the question of why a JAK2 inhibitor would be equally effective in managing myelofibrosis symptoms in patients who do not have the JAK2 mutation. That’s about half of all MF patients. The research reported on in the Levine Nature letter does not address this question as all cells, human and murine, studied were positive for the mutation. However, now that it has been established that heterodimerization is responsible for the persistence of MPN cells in the presences of inhibition, it is only a small leap to posit the possibility that other kinases disrupt the JAK STAT pathway in ways that JAK inhibition resolves. And, since proliferation and differentiation of all hemapoietic cells depend on JAK2 expression, inhibition of this kinase would seem capable of disrupting downstream signaling . That’s speculation. Here are some immediate therapeutic implications of this work. The Levine group started this work while all JAK2 inhibitors were still in clinical trial and completed the Letter six months before Jakafi became the first — and so far, the only — JAK2 inhibitor to be approved by US and European regulators. Since that time there has been extensive reporting of the Phase III COMFORT trials and substantial numbers of MF patients starting therapeutic Jakafi regimens. The two central findings of this Letter come at a critical time for MF patients and caregivers. In cases where patients have terminated JAK2 inhibitor therapy because Jakafi was no longer effective, the finding of resensistization could be a new lease on life. And in putting forth a possible reason in heterodimerization for the persistence of disease burden despite JAK2 inhibition, the work provides a platform for strategic assessment of new drug targets and therapeutic approaches. The JAK2 allele burden does not decline during extended inhibitor therapy. The Mayo Clinic’s Dr. Ruben Mesa agrees. ” This is an important paper. Combination trials with HDAC inhibitors and JAK2 inhibitors are ongoing,” he says. My father is battling this disease. The jakafi has seemed to stop working. Can anyone please help. He was recently seen at a hospital in Philadelphia and once again not given much hope. They just keep him on the jakafi. I welcome any ideas. Thank you. Hello, Dawn… I am sorry to hear your father is no longer getting relief through Jakafi. Without much more information it’s hard to suggest alternatives. Jakafi is designed to improve a patient’s clinical condition by dealing with effects of MF, like splenomegaly, etc. but it does not address the underlying disease.. or at least not usually. (This article with the Ross Levine finding on JAK inhibition gets into more detail on that.) Depending on what’s happening with your father there are other drugs to deal with symptoms but for now, at least, the only “cure” for MF is stem cell transplant. Depending on age and condition your father may not qualify but surely your hematologist would know. Have you sought a second expert opinion? I was diagnosed in March of 2005 with MF. (Also prostate cancer.) I was on Thalimid for a few months. I was on Revlimid for 2.5 years with prednisone. I will start Jakafi this week, 9-13. I hope all goes well. I have a huge spleen, low platelet counts and fatigue. Sweats and itching have lessened. Wishing you all the best. Exercise if you can do it is essential to beating fatigue. I am not saying its easy but if you slowly develop a program it can change your life. If I stop working out the fatigue come backs so I have to keep at six days a week. I was just put on PEg-INFN. On wonders whether Jakafi (or other JAK2 inhibitors) in combination with other anti-cytokine/antiproliferative agents (eg interferon) would get around this adaptation. Great news! Thanks to all who are working on this! Thank you so much, Zhen, for elucidating this for us, and posting it. Is anyone taking Jafaki and Peg-IFN and the same time. I wonder if the combination of the drugs might offer some better treatment? Yes, I’m on both 20mg Jakafi and .75 mcg Jakafi. I think I’m doing well, but it’s only been about 6 months. I’ve slowly increased the Pegasys and had to up the dose of Jakafi a few months ago when my spleen began to grow and night sweats returned. So in summary, if Jakafi quits working, you stop taking it for 2-3 weeks then resume taking it and it works just like new? Very interesting. Am I confused here? Those are the findings and the key question, Steve. In mouse studies the interval for resensitization of cells to Jakafi was 2-4 weeks. There were human ex vivo cell studies as well to confirm that. I don’t believe there is currently a protocol calling for deliberate interruption of Jakafi therapy to prevent loss of response but surely resumption of Jakafi seems a clear enough option. As soon as I read this, I thought of Barbara Beckman. Good news indeed! I am so glad she already read the article. Zhen, you continue to amaze me. This is important information for me, since Jakafi stopped working for me. To make sense out of this new finding requires a lot of brain power! Thank you. Joe had three lapses in using JAFAKI since 9/12/2008. Perhaps it may be the reason he continues to had a great Quality of Life. Time will tell but Joe would fight anyone taking his drug away.